– WiiMote timeout increase from 60 to 300 seconds. – Use libfat 1.0.7 as disk access engine. – Make source code compliant with r21 compiler. – Added local highscore position calculation. – Improve source code documentation. – Added screenshots to source code documentation. 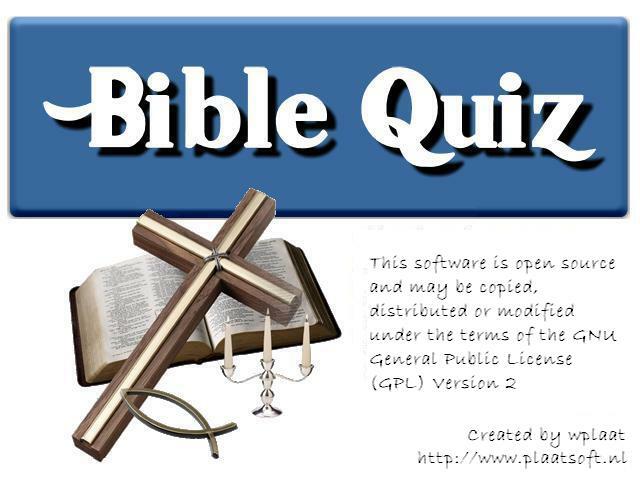 This evening BibleQuiz 0.95 for Nintendo Wii is released by PlaatSoft. – Update main menu screen information. – Use libogc 1.8.3 as Wii interface engine. – Added source code to Google Code Repository. – Added source code documentation (Javadoc style). – Added Doxygen (automatic documentation generation tool) config file. – Added Wii DVD light effects to game. – Improve game settings screen. – Added scrollbar to highscore and release notes screens. – The 100ste highest local scores are showed. – The 40ste highest today and global high scores are showed. – Added to most screens network status information. – Extend user name from 3 to 6 characters. – Default user name is based on Wii nickname. – Increase http buffer size from 8kb to 10kb. – Bug fix: Http thread memory cleanup was not correctly executed. – With the doxygen tool the documentation can be generated. – Build game with devkitPPC r19 compiler. – Update url on intro screens to www.plaatsoft.nl (My new domain). – Improve intro screen positioning by PAL 50Hz TV mode. – Network thread status is showed on screen. – Game score is send anonymous to internet web services. – Bugfix: Highscore is now always loaded correctly. – Build game with libogc 1.7.1 and devkitPPC r16 compiler.